One of the highlights of being involved in Year 10 at Strathcona is the Year 10 Camp at the end of each year. Base camp is Merricks Camp & Conference Centre near Ballanring but activities are all over the Mornington Peninsula. Activities this year includes sailing at McCrae, sea kayaking off Pt Leo, Snorkeling at Popes Eye in Port Phillip Bay and with the seals at Chinaman’s Hut, Tree Climbing and games at base camp, rock pool exploring at Pt Leo, and surfing at Crunchies near Pt Leo. 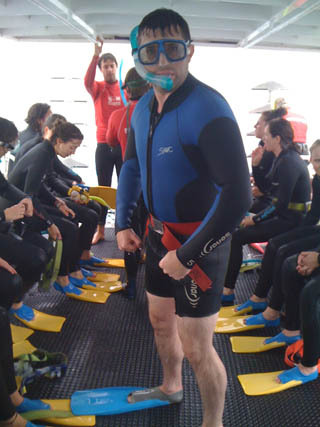 Here is me about to meet the seals in Port Phillip Bay.